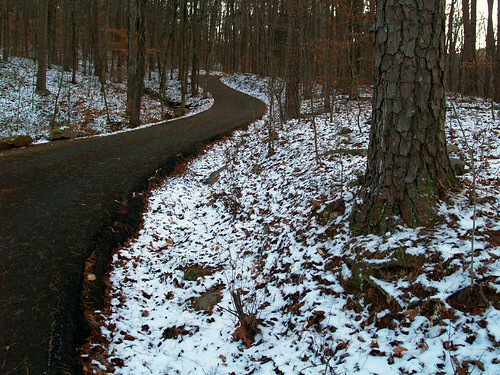 Snow is somewhat rare in Arkansas, especially around Little Rock. I used to get so annoyed when I was younger and snow storms would blow across the state, giving other kids a few days off from school. I don't know what it is about Little Rock, be it the lower elevation or the trapped residual heat stored up in concrete, but it seemed like most snow storms would drift around the city. It was a pain to sit and watch the news in the morning while seemingly every school district in the state was closed, but us poor city kids would have to go in. But snow on Christmas is even rarer than that. I can think of only a few times that we've had a white Christmas. The most notable was 2000, the year a massive ice storm hit the state on Christmas Day. I was visiting relatives in Charleston that day, and my parents and brother decided to leave early in the hopes of beating the storm back to Little Rock. 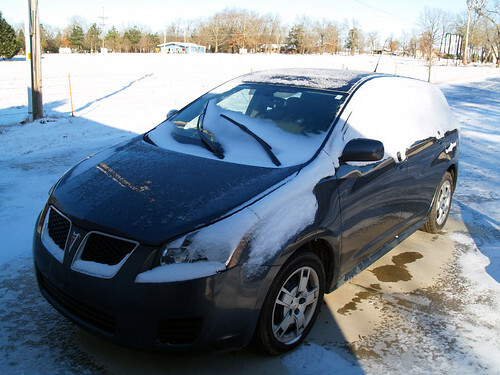 It didn't quite work out, as inches of freezing rain piled on the cars and made the interstate a complete mess. Accidents on all the freeways in Little Rock closed access to the city, all the bridges over the river were closed due to wrecks. It usually takes two and a half hours to make that drive. In 2000, it took us 13 hours to get home. But this year, another winter storm hit the state. 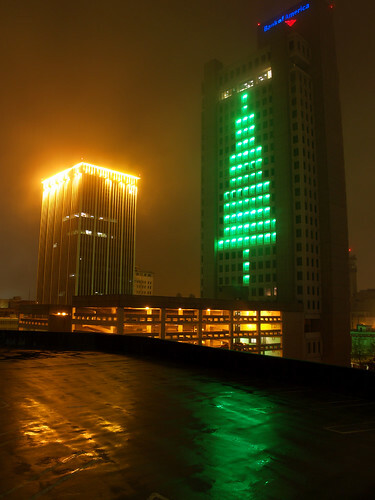 And per tradition, it didn't do anything in Little Rock besides just rain a lot. But the western and northern parts of the state saw some accumulation. Luckily, I was again in Charleston where about two inches of snow fell. I woke up on Christmas Day and went out in the below-freezing weather to get this shot of the new car in its first snow. It was sunny, so most of the snow started to melt. Which is good since it didn't make traveling too difficult for people. The only delay in my drive home would be from stopping to take pictures along the way. 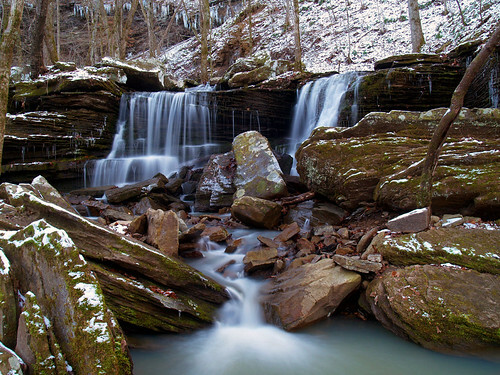 I wanted to get some good pictures of the snow, and decided to make a quick stop at Longpool, which isn't too far from the freeway at Russellville. But I had left Charleston a bit too late on Saturday, and was quickly running out of time and daylight. I got into Longpool at 4:30, which meant that I would have just about 30-45 minutes of light to get any sort of pictures. I got back to the car before it got too dark, and continued on towards home. I even made it back in time to unwrap a few more Christmas presents. I spent a few hours last Saturday working to get stuff ready for the upcoming gallery show, which meant a few hours spent cutting mat and foam boards (with a quick lunch trip to Whole Hog, of course). 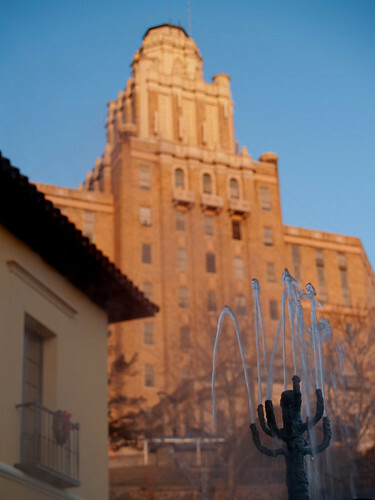 But I was able to get out and make a trip down to one of my favorite cities in the state - Hot Springs. I managed to get there with some light left in the day, so I walked around the bathhouses in the National Park as the setting sun cast a warm glow on everything. 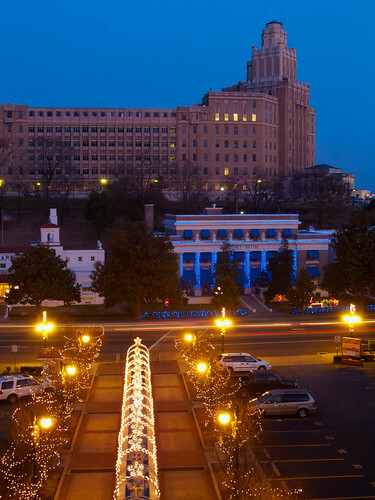 Hot Springs is a great city to visit for photography. Some of the best old buildings in the state sit within the city and the National Park. I'm amazed at the history of this city, which went from being a sleepy small town next to a few open springs to one of the premier tourist attractions in the country. In its heyday, Hot Spring was the Las Vegas of its era. Illegal casinos operated across the street from Bathhouse Row, with gangsters joining the crowds there looking to take the baths. 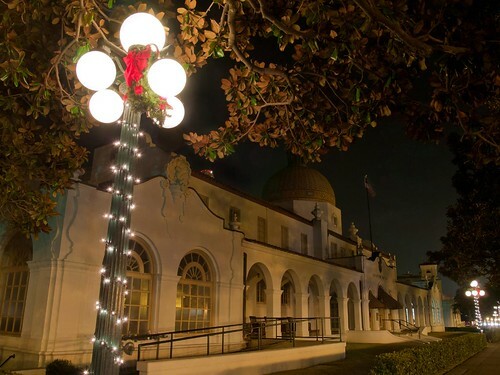 I'd love to be able to travel back in time to Hot Springs back in the 1920's or 30's, perhaps rubbing shoulders with Al Capone at the old Southern Club. Sadly, the new car has no flux capacitor included. 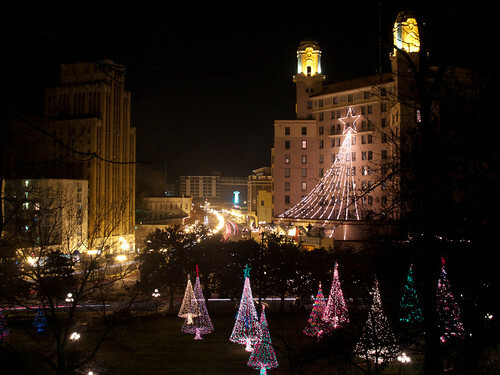 As it began to get dark, I headed up to a parking deck just off of Central Avenue. I had an idea for a shot, with a view looking down onto Central Avenue, Bathhouse Row and the old Army and Navy Hospital. 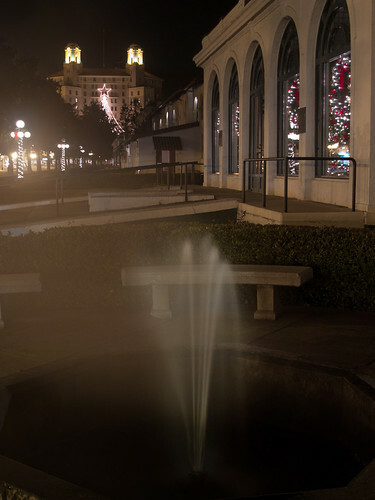 I was happy to see that the city was kind enough to put up some Christmas lights along a fountain that leads to Central Avenue, and I stood out there in the cold next to the camera waiting for it to get dark. Luckily this is a public parking deck, so no security came out to see what I was doing. 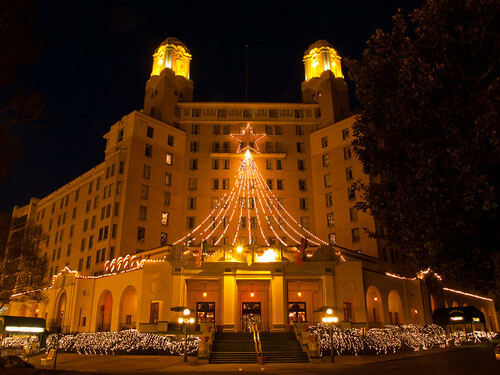 After it got dark, I walked back over to Bathhouse Row and then over to the Arlington Hotel. 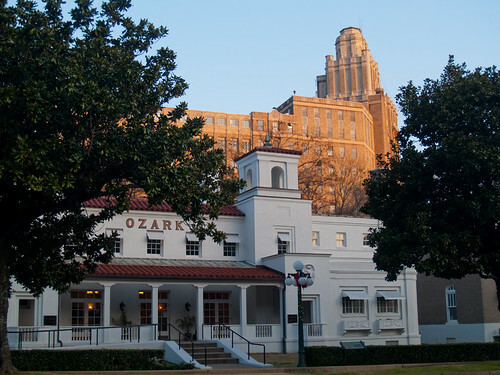 The Arlington Hotel has been operating in Hot Springs since 1875. The current hotel was built in 1924, and has been host to people ranging from Franklin Roosevelt to Babe Ruth to Yoko Ono. Al Capone would always stay in room 442, but would always rent out the entire floor for his buddies and bodyguards. From here you can head up the hill to enjoy a nice view of the Arlington and the city. This was taken just above the display spring, one of the 47 hot springs in the National Park. It was cold out that night - about 39 degrees - and there was a lot of steam rising up in front of the camera when I was trying to take pictures. I went back down the hill and walked Bathhouse Row again. I stopped at one of the two fountains near the Fordyce Bathhouse. Large amounts of steam were billowing out from the fountain, drifting over me and the camera before drifting off into the night sky. A bit further down sits the Quapaw Bathhouse, which might be the most recognizable bathhouse because of its distinctive dome. This streetlight here was hitting the leaves on one of the many magnolia trees along Central Avenue. I took a few more pictures along Bathhouse Row, then went back to the car to warm up. I wanted to hit a few more spots in Hot Springs, one of them being the county courthouse. I drove by and it was decked out in lights. But as I got out of the car, I was saddened to see the camera showing that the battery was low. I got a few shots there that didn't really turn out at all. From there I went over to the neat old church just a few blocks away, the St. John the Baptist Catholic Church. This is a great old church, built in 1908. I went up there to quickly take some pictures before the battery died, standing in the parking lot and getting in the way of annoyed church visitors. I forgot that it was Saturday night and people were probably going there for Mass. Whoops, sorry! 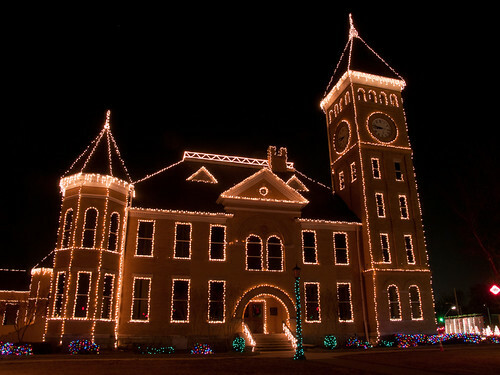 On the way back home I made a quick stop in Benton to see the Saline County Courthouse decked out in its holiday lights. There wasn't much life left in the battery, so I didn't stay out there too long. But I hope everyone who reads this (all 4 of you!) has a Merry Christmas, a Happy Hanukkah, or a festive whatever! On Saturday I just happened to be downtown reviewing prints for the upcoming gallery show (January 8th - April 4th at the Historic Arkansas Museum! ), when it began to get dark. 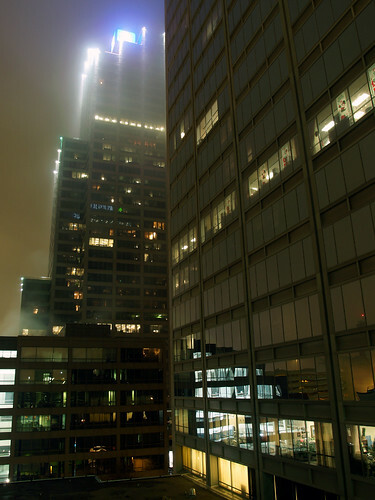 It was cloudy and a bit rainy, and a thick fog began to descend over the city. Luckily I had the camera with me, so I headed out into the night for a few pictures. The first stop was on the north side of the river, where I tried to get a shot of the Junction Bridge and the skyline dissolving into the fog. 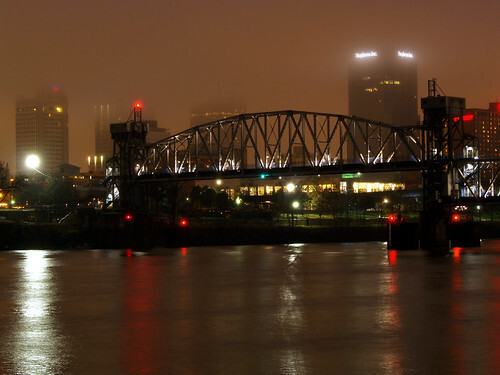 I like this spot to get pictures from, but I'm always annoyed by the giant light on the Little Rock side. What's the use of this bright light that seems to just shine right into the river? I went back over into Little Rock and drove around a bit, trying to find something else to get a picture of. 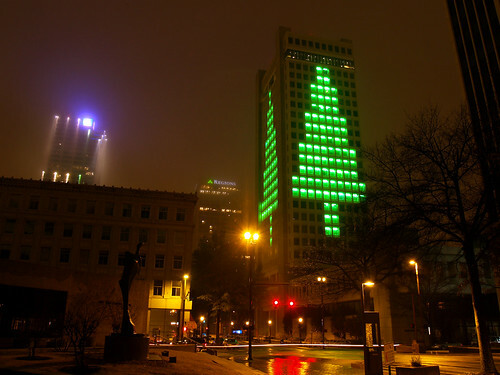 Every year, the Bank of America building puts up a large Christmas tree light display on three sides of the building. Here is the view, by the intersection of Capitol and Louisiana streets. One other downtown skyscraper with an interesting lighting display is the Metropolitan National Bank Building. 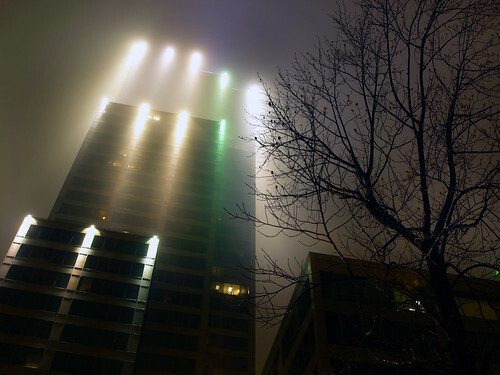 It has lights that shine down, which in the fog makes it look like a space ship getting ready for take off. I drove to a parking lot across from the building and got this shot looking up at it. From here, it looks more like the space ship from "Close Encounters of the Third Kind" making a landing. I went to another parking deck nearby to get a shot of the Bank of America building again. There was a heavy mist in the air now, which would try very hard to get as much moisture on the front of the lens as possible. I did spent too long up there and wore out my welcome. A few minutes later the parking deck security guard would drive up and politely ask me to leave. 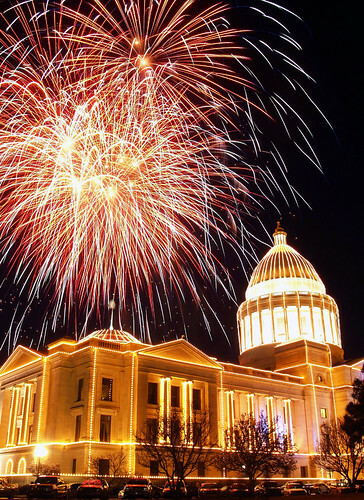 One of the best holiday traditions in Little Rock is the annual fireworks show at the state capitol. More than 300,000 lights adorn the walls of the capitol, and they are turned on for the first time as fireworks pop above the building. I headed out there Saturday night for the show, along with my Aunt and parents. We sat up next to one of the memorials on the edge of the grounds. The spot we chose seemed to be a popular spot, with a few other photographers setting up tripods nearby (including Mike and Karla Hall). It was a bit chilly out there, the thermometer in the car said it was about 40 degrees. But after having stood in the cold the night before (when in was in the mid-20s), that seemed downright tropical. 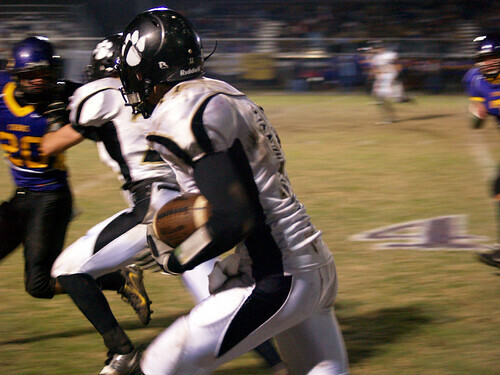 On Friday I took off early from work to make a trip down to Hot Springs for a high school football game. 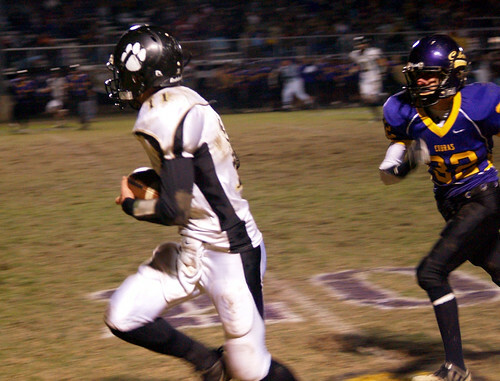 This wasn't just any high school football game - it was the playoffs! I was there to support Charleston. Now I didn't grow up or attend school in Charleston, but my family is from there and my cousin is on the team. 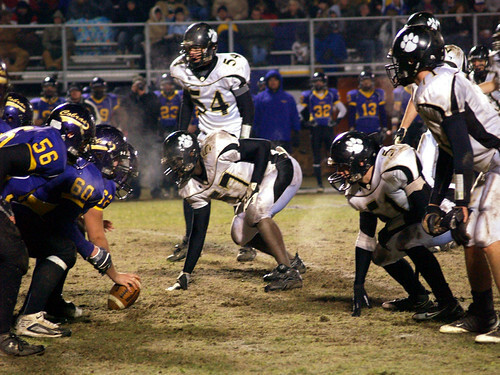 Many Friday nights in the past few years have been spent watching Charleston play. 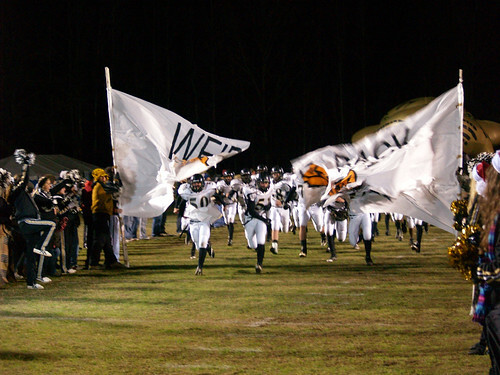 But this game on Friday night would be epic. 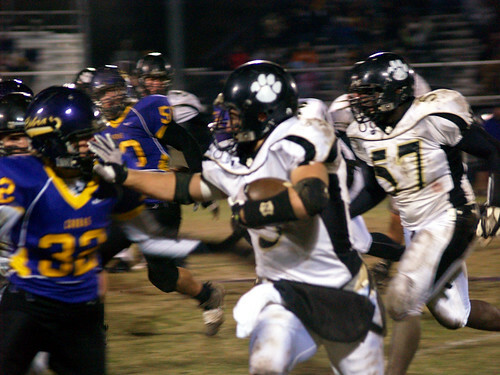 It seemed much more than a playoff game, it was more like the state finals. 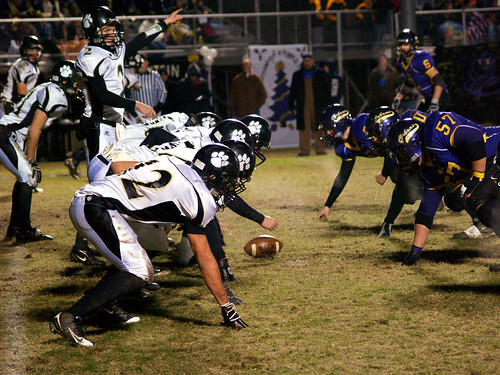 Before the game, Charleston was ranked #1 in the conference, while Fountain Lake was ranked #2. It also seemed like the final because the last time these two teams played each was last year, in the state finals. I drove down to Hot Springs with my Dad and Aunt, and we made a quick stop in town for dinner at King's Chinese Buffet (love that place). The game was to be played at Fountain Lake, which is located just north of Hot Springs along Hwy. 7. We drove past Bathhouse Row and the clouds of steam coming from the springs. It didn't take us long to reach Fountain Lake, and the stadium. I have to give Fountain Lake credit because they have a neat stadium. The stadium is situated on the top of a hill, and the field is surrounded by trees. While most high school football stadiums seem kinda dull, this one made it seem like you were sitting out in the middle of the woods watching a game. Also, the stadium had good lights, which made taking pictures easier. But I do have to add that the football stadium at my alma mater (North Little Rock High School - go Charging Wildcats!) had an interesting stadium too. There is a Waffle House right next door, so often times the stadium would smell like bacon and waffles. 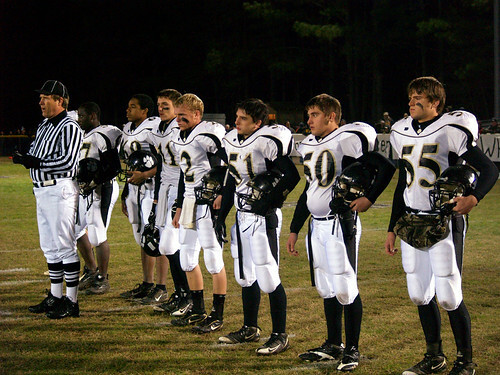 Before the game, the senior players for Charleston stood on the field to watch the coin-toss. 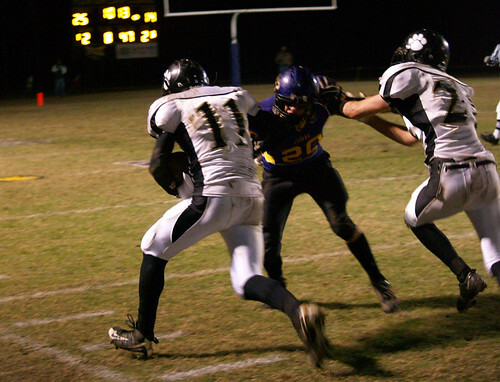 Included in that group is my cousin, #11. It was a bitterly cold night out there. The temperature quickly dropped well below freezing. 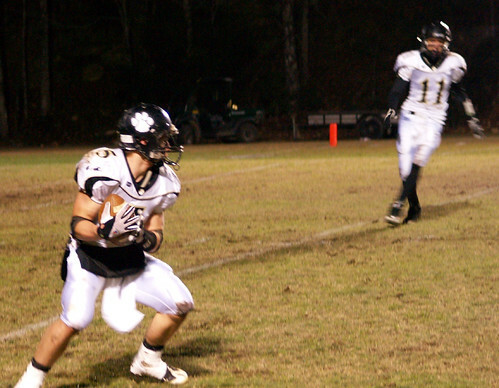 This was taken in the first quarter, where Charleston would score the first touchdown of the game. At halftime, Fountain Lake was winning 25-14. And it had gotten even colder. I had long since lost all feeling in my feet, even though I had tried to dress as warm as possible. The players left the field at halftime for either the locker room and/or a makeshift tent on the side of the field, I hurried over to one of the heaters along the sidelines. The heater looked like some sort of jet engine, but it was warm. 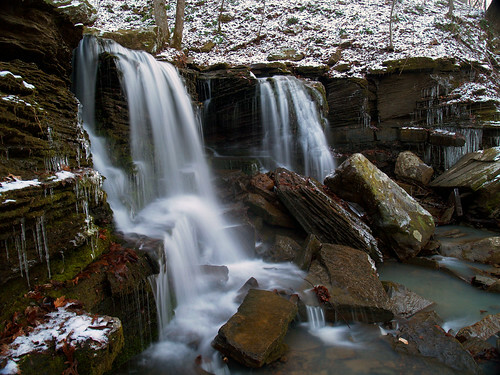 I stuck a frozen foot there and tried to gain some feeling back in my extremities. That was probably a mistake, since it just made it worse as the cold air came back with a vengeance. It was so cold out there that I wondered how the game would have been different had it been a bit warmer. 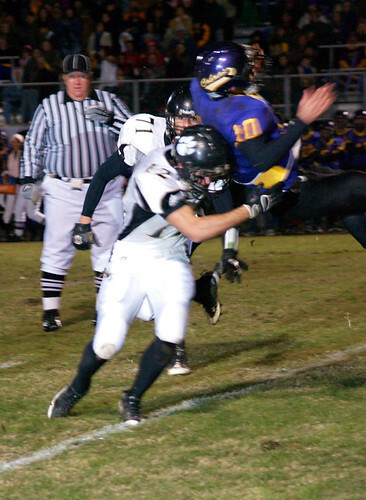 I know very little about football, but I think both teams would have scored more had it not been freezing out there. There were no more goals in the second half, and the game ended at 25-14. It was bad enough standing on the sidelines, I can't imagine what it must have been like for the players. But they tried their best, and neither team gave up until the final whistle. 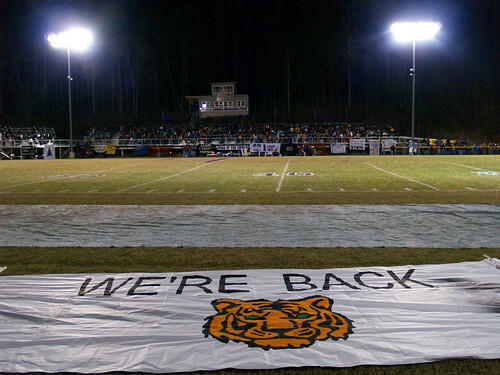 When the game was over, we drove back into Hot Springs. Along the way, the thermometer in my car showed it to be 24 degrees outside. I went into Fort Smith that night with one shot in mind, a view of the Immaculate Conception Catholic Church at dusk. 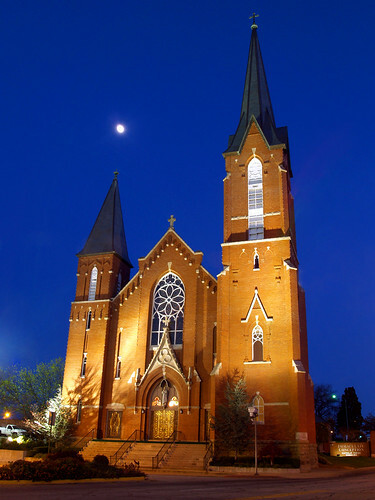 It is an impressive old church, and it sits in a prominent location that overlooks downtown Fort Smith. 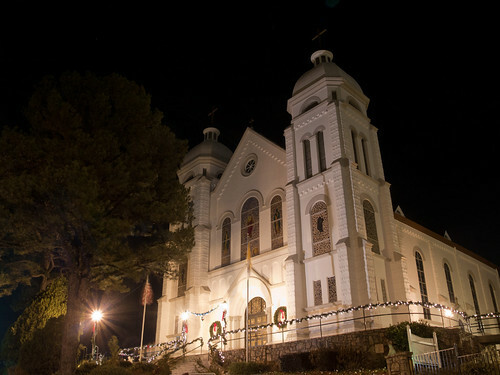 It was warm and pleasant that night, and I sat up the camera as church patrons were entering the church for Mass. I've been inside it just once. Five years ago, I was a groomsman in a wedding there for two of my friends from college. The inside of the church is just as impressive as the outside is. This building was constructed in just 18 months and was dedicated in June of 1899. I wanted to get a decent shot of the church so that I could give a print of it to my friends as a Christmas present. Now one of my friends is also a photographer, but she is also a fan of good photography, which means she probably doesn't bother looking at this site too much. So I think I'm safe in posting this here and not spoiling the surprise (and if you do see this Will or Jenny, act surprised at least! ).